After a very successful morning of fishing I was unhooking my Berkley Flicker Shad from the mouth of another fish. Before I could finish the process the fish gave a quick head shake and the free treble of the lure quickly made its way into my thumb. 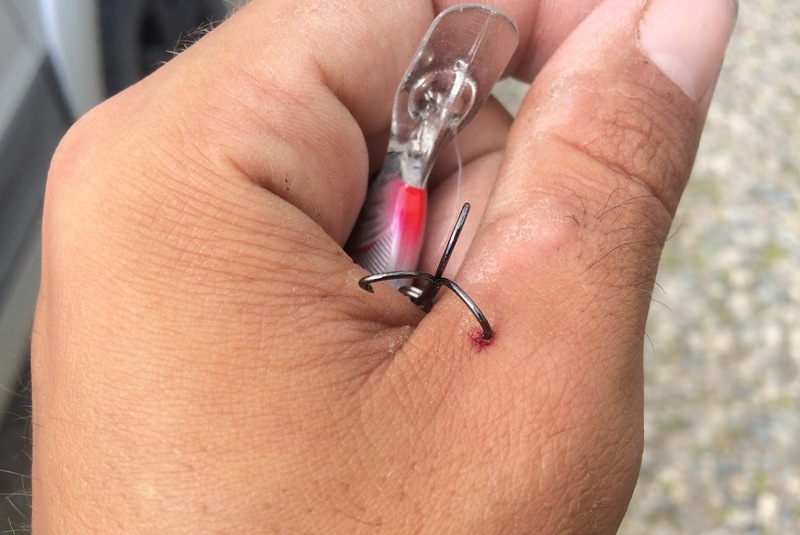 It was a sharp de-barbed treble hook and it didn't really hurt when it punctured me however trying to extract it caused a fair amount of pain. It became clear that a trip to the local ER for some lydocaine would be needed in order to get the damn hook out so we headed to the launch, loaded up the boat and headed home. It being a holiday Monday the local walk in clinics were closed, leading to a bit of added strain on the ER. 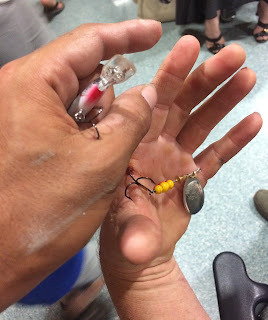 Ironically there was another man in the waiting room with a hook in his hand , although his was not debarbed. After a four and a half hour wait I finally had the pleasure of getting the hook out of my hand and the needle administering the freezing was the most painful part. The whole process took less than 5 minutes but I did note the fellow with the barbed hook was in there for over 90 minutes and came out with quite the bandaged hand. Two days have since passed and the wound has healed, swelling is gone and my thumb has regained its movement.